First, ask your employees if they want to discontinue this age-old tradition that often ends up being harder to execute than people expect. Explain how forgoing Secret Santa gives the “gift of time,” since everyone will have one less gift to buy and wrap. 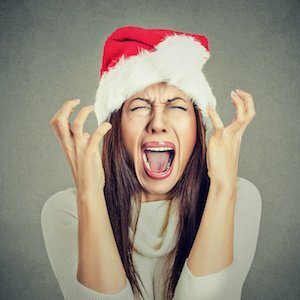 And don’t worry about being perceived as Ebenezer Scrooge because you “killed Secret Santa”—it will definitely be a relief for some people. You might even consider replacing it with making a donation to a local charity chosen by the employees themselves. Another added benefit of eliminating Secret Santa is avoiding the awkward moments when the “Santa” gives the absolute wrong gift. For example, years ago I was someone’s Secret Santa who I knew was traveling to Mexico over the New Year’s break. Que bueno! For an entire week, I secretly left a Mexican-themed gift on his desk. Day 1: A Fodor’s travel guidebook to Mexico. Day 2: A map of Mexico. Day 3: A six-pack of Dos Equis beer and a lime. Day 4: A six-pack of Corona beer. Day 5: Another lime. Day 6: Mexican sea salt. And drumroll for Day 7 please: A bottle of tequila! I assumed my thoughtful secret gifts for him were perfecto, until I found out that he was a recovering alcoholic who was wearing an ankle bracelet monitor for a DUI. Yikes! Consider pushing the Holiday Party to January. Most employees are already busy with other parties in December and some just flat out despise having to attend an office party. Again, empower your employees to make the decision by letting them vote on their preference. Schedule an afternoon “off” for desk and/or workplace clean-ups. Removing clutter provides a natural stress relief and also helps employees feel like they are beginning the New Year with a fresh and unencumbered start. Schedule an all-staff clean up for a couple of hours in early December. Encourage employees to bring their leftover Halloween candy to the event, but also buy some nice holiday cookies and other festive treats as well. Amp up some holiday music for employees to enjoy while they clear their inboxes, clean their desks, delete old computer files, and organize their calendars. Try to prevent scheduling big deadlines for the end of the year. The fact that the year is ending already naturally brings a multitude of deadlines. Moving other goals and deadlines into the new year significantly reduces holiday stress. Of course, some of the pre-holiday work crunch is inescapable, so managers may want to consider hiring interim or temporary staff during this period. Give your employees time to shop. A perfect way of doing this is to allow your workers an hour or so to cyber-shop on Cyber Monday, on company time. While many employees will enjoy this shopping time allowance, know that the majority of employees (65%), say they would prefer to have a paid day off on Black Friday, according to Robert Half Technology. Either way, encouraging your team to get their shopping out of the way early can help them focus on work as the holidays get closer. Do everything in your power to accommodate employee holiday leave requests. Holiday time is family time. By allowing time off during the holidays, you are sending a clear signal to your employees that you are a family-supportive employer/manager, while simultaneously helping lower their stress levels. And don’t forget to enjoy your own time off with your friends and family. Happy holidays! This entry was posted in Blog and tagged best boss, company culture on November 23, 2018 by Kevin Sheridan. The Disturbing Signs That We Have A Long Way To Go In Closing The Workplace Gender Gap Is your communication style a message in a bottle?